Current investment policy trends can be generally characterized by further liberalization and facilitation of foreign investment. At the same time, efforts to regulate foreign investment to advance public policy objectives (e.g. protection of the environment, alleviation of poverty, and/or addressing national security concerns) have intensified. This dichotomy in policies and the political will to rebalance the respective rights and obligations of the State and investors are becoming apparent at both the domestic and international policy levels, with emphasis swinging towards the role of the State. The network of international investment agreements (IIAs) has expanded further, while attempts to ensure balance and coherence within the IIA regime are under way. Furthermore, investment policymaking is attempting to reflect the closer interaction between investment policies and other policies, including those relating to broader economic, social and environmental issues. National investment regimes continued to become more favourable towards foreign investment, while governments have increasingly re-emphasized regulation. 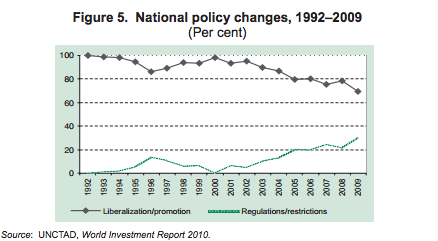 Out of the 102 new national policy measures affecting foreign investment that were identified in 2009, the majority (71) were in the direction of further liberalization and promotion of foreign investment (fig. 5). This confirms that the global economic and financial turmoil has so far not resulted in heightened investment protectionism. Policies included, inter alia, the opening of previously closed sectors, the liberalization of land acquisition, the dismantling of monopolies, and the privatization of state-owned enterprises. Measures to promote and facilitate investments focused on fiscal and financial incentives to encourage FDI in particular industries or regions, including special economic zones; easing screening requirements; streamlining approval procedures; or accelerating project licensing. To improve the business climate, corporate tax rates were also lowered in a number of countries, particularly in developed countries and developing economies in Africa and Asia. Growing fiscal strains may eventually result in a reversal in the trend observed over the past decade, however. In spite of the general trend toward liberalization, 31 of the new national policy measures were towards tighter regulations for FDI. Accounting for over 30 per cent of the total, this is the highest share of such measures observed since 1992, when UNCTAD started reporting these measures. These measures are driven in part by increased concern over the protection of strategic industries, national resources and national security. Recent crises, such as the turmoil in the financial markets and the impact of rising food prices, have also translated into a will to regulate specific industries. Lastly, emerging economies are giving more weight to environmental and social protection, while LDCs are filling gaps in their regulatory frameworks. As a result, new limitations on foreign participation were introduced in some industries, or procedures for the screening and approval of investments were tightened, sometimes on national security grounds. Greater state intervention in the economy was most obvious in expropriations – which occurred in a few Latin American countries – and an increase, in state participation in companies as part of financial bailout measures. The expected reversal of temporary nationalizations in sectors often considered as strategic could result in governments pushing to have privatized companies remain in domestic hands, or pressuring investors to keep production and jobs at home. As a result, the phasing out of rescue packages will need to be closely monitored, as risks of investment protectionism have not disappeared. Thirteen G20 countries continue to carry outstanding assets and liabilities left as a legacy of emergency schemes. The total amount of public commitments – equity, loans and guarantees – on 20 May 2010 exceeded $1 trillion. In the financial sector, several hundred firms continue to benefit from such public support, and in non-financial sectors, at least 20,000 individual firms continue to benefit from emergency support programmes. The international investment regime expanded in scale and scope, and a systemic evolution towards a regime that is more balanced in terms of the rights and obligations of States and investors is taking shape. The international investment regime is evolving rapidly through both the conclusion of new treaties and an increasing number of arbitral awards. 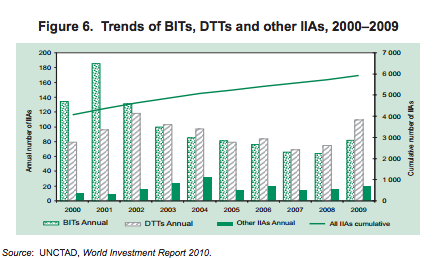 In 2009, 211 new IIAs were concluded (82 bilateral investment treaties (BITs), 109 double taxation treaties (DTTs) and 20 other IIAs) – on average about four new agreements per week. In all, the total number of agreements rose to 5,939 at the end of the year (fig. 6). The trend towards rapid treaty-making continued in 2010, with the first five months seeing the conclusion of 46 more IIAs (6 BITs, 33 DTTs and 7 other IIAs). A major recent development occurred in Europe, where the Lisbon Treaty transferred FDI competencies from member States to the EU. As for investor-state dispute settlements, at least 32 new cases were initiated in 2009 and 44 decisions rendered, bringing the total of known cases ever filed to 357, and those concluded to 164 by the end of the year. The overwhelming majority of these 357 cases were initiated by investors from developed countries, with developing and transition countries most often on the receiving end. Some arbitral awards resulted in inconsistencies and lack of coherence between arbitral decisions. Regional integration – as well as the need to promote coherence and reflect broader policy considerations in IIAs – is driving systemic changes in the international investment regime, creating the opportunity for a more coherent, balanced, development-friendly and effective international investment regime. The IIA landscape appears to be consolidating through (a) an increase in broader plurilateral economic agreements that include investment provisions; (b) efforts to create regional (mainly South-South) investment areas; (c) the competence shift concerning foreign investment within the EU; (d) the abrogation of BITs to streamline the treaty landscape and eliminate contradictions with other legal instruments; and (e) efforts by numerous countries to reassess their international investment policies to better align them with development considerations by revising their model BITs, reviewing their respective treaty networks and their development implications, or denouncing their BITs. In addition, many recent treaties, whether new, renegotiated or revised, suggest that governments, developed and developing countries alike, are increasingly seeking to formulate agreements more precisely, by clarifying the scope of treaties or the meaning of specific obligations, in order to preserve States’ right to regulate. Environmental clauses, as well as clauses seeking to ensure appropriate corporate behaviour in areas such as social practices, are becoming increasingly common, too. Making IIAs work effectively for development remains a challenge, however. Although international investment arbitration remains the main avenue for resolving investment disputes, systemic challenges are increasingly becoming apparent in the dispute settlement system. As a result, a number of countries have been refining the investor-state dispute settlement provisions in their IIAs, seeking to reduce their exposure to investor claims or increase the efficiency and legitimacy of the dispute settlement process. In addition, several sets of international arbitration rules – including those of the International Centre for Settlement of Investment Disputes (ICSID), the International Chamber of Commerce (ICC) and the United Nations Commission on International Trade Law (UNCITRAL) – have been or are being revised. At the same time, a few developing countries are turning away from international arbitration processes, denouncing the ICSID Convention or looking into alternative dispute resolution and prevention mechanisms. Besides investment treaties, recent policy initiatives to deal with global challenges also have implications for international investment. Several efforts have been launched to establish international principles for responsible investment in agriculture. These include a joint initiative on promoting responsible agricultural investment, jointly spearheaded by UNCTAD, the Food and Agriculture Organization of the United Nations, the International Fund for Agricultural Development and the World Bank Group. Such principles, if embraced and implemented, could enhance the benefits of FDI in agriculture while mitigating its potential downsides, thereby contributing to strengthening food security and local development. The members of the G20 committed themselves to refraining from protectionism in the area of trade and investment, and asked intergovernmental organizations, including UNCTAD, to monitor and publicly report on developments related to trade and investment protectionism. Efforts are also under way, both at the national and the multilateral level, to reform the financial system and address the weaknesses that underpinned the global financial crisis. These will have significant implications for FDI flows. Attention needs to be given to coherence between the emerging international financial system and the international investment system, the interaction of which has been largely neglected. While the two systems have developed in parallel, both govern short- and longterm cross-border capital flows.